Volunteers donating blood in a modern center, medical machine in work. A donor uses equipment while sitting in a chair at a transfusion center. One doctor checks blood donors in a donation center, charity work. 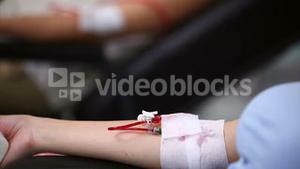 People donate blood in transfusion center, medical equipment. Blood donation. Male hand of blood donor and squeezing rubber ball for bumping blood during procedure of collecting venous blood in hospital. Doctor puts a needle in patient's arm to take blood, donating center. 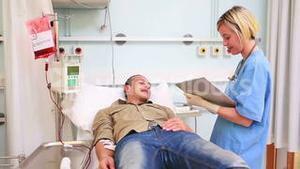 A man donates blood in a clinic, transfusion machine works. A donor undergoes a blood transfusion while donating in a special center. Fresh plasma stored in bags at a transfusion center. Person squeezes a ball while donating blood in a center. Transfusion machine collects blood plasma from a donor. Modern machine works in a transfusion center, pumping blood. Somebody's hand during blood donation campaign in laboratory of the hospital. Frame. Close-up. Blood donation. Male hand of blood donor and squeezing rubber ball for bumping blood in hospital. Closeup of nurse removing needle from blood donor's arm. Closeup of a blood donor. Closeup of a nurse finding a vein before inserting a needle.